Product development involves an inherent tension between the spirit of the ground-breaking founders and the low-risk processes that intended to ground and stabilize that product. In a Lean organization, the Value-Creating Architect (VCA) is responsible for the balance between them. The communications market weren’t the only ones amazed by Motorola’s first series of cellular phones. Veteran industries such as banking, printing and music were disrupted, too. A decade later, internet search engines changed the character of the retail, tourism, health and advertising markets. Since then, market-disrupting technological development has provided new players with a ticket into the game and changed the conditions of survival for incumbent players. Industries that have not adapted to these revolutionary technological changes have been pushed to the margins of the market. By the end of the 20th century, the world of computers and internet had become a stock-market bubble, in which start-up companies were traded for hundreds of millions of dollars and more, sometimes even before they had successfully produced a mature product. Today, time to market continues to influence the business status of technology developers and industry leaders – being the first with an innovative technology can transform product developers into industry leaders, and they are under pressure to launch a product before it is ready. Technological pioneers operate at a high level of uncertainty and maintain a high-risk profile in terms of both business and technology: A technological risk is defined as the level of uncertainty involved in providing a mature, robust technological response to a business customer within the necessary parameters of quality, time to market, price, and safety. A business risk is evaluated according to the ability to realize the potential of the technological influence to become a disruptive idea for a valuable product in a competitive market. The two charts below illustrate the risk factors at the beginning of development. 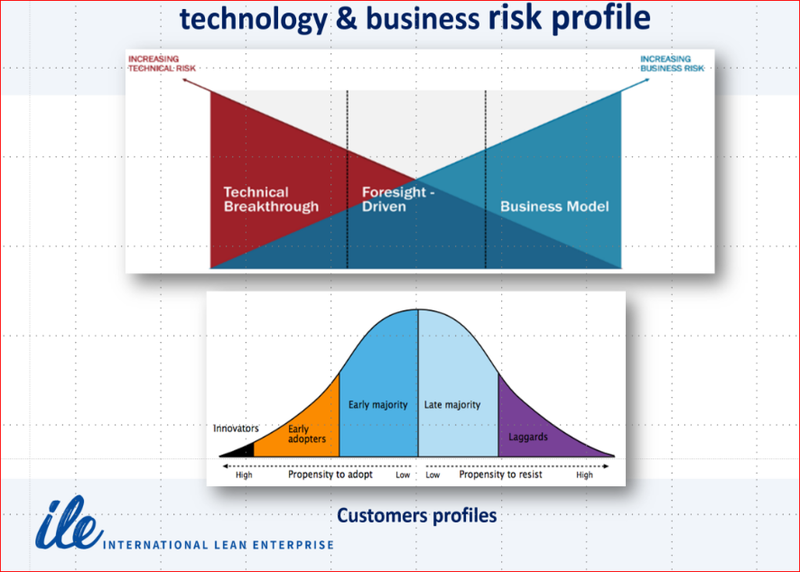 The dilemma of technological and business risks is present in the upper chart: At the beginning of the process of product-development, the technological risk (in red) is high, while the risk of the business level in blue is low. The lower chart presents the distribution of the population of consumers according to the risk they are willing to take with regard to the timing of the exposure of the product. “Innovators” and “Early adopters” customers, who are constantly searching for technologies that disrupt the market, are willing to step up early and purchase alpha and beta versions before the product is mature, just as cancer patients are willing to try a new medication that has yet to be approved. In contrast, more conservative customers, the “Early” and “Late Majority”, avoid risk-taking and will not exchange their old products for new technologies until those technologies have achieved a high level of maturity. Entrepreneurs are required to articulate the purpose and vision that will enable them to enlist the resources necessary for the technological and business stages. In this context, they must struggle against and disrupt the forces of inertia and maintenance and, ultimately, change the nature of the market. Disruption of the marketplace status quo is a momentary flash, and it cannot continue for long. If the developers of the technology do not strive to contain the risk and mature the product, they may find themselves pushed off into the margins by players who took advantage of the window of opportunity and the technological breakthrough in order to complete the development of a mature, reliable product. Today, the time period needed for the progression from market-disruptive technology on the basis of a minimal viable product (MVP) to a stable, reliable response to risk-aversive customers is growing shorter and shorter. Pioneer customers in the use of Motorola’s first cellular telephones (which were innovative, heavy and cumbersome) were willing to accept the poor quality of sound and the frequent disconnections, but the business customers at the heart of the market who had already been exposed to this initial technology wanted a more mature robust solution. Once the breakthrough had been made and the technology had become an accepted industry standard, the industry changed its nature and the customers preferred Nokia and, subsequently, Apple, Samsung, and the dozens of other brands that offer a quality product at a competitive price with a low technological risk. Breakthrough entrepreneurs who want to avoid Motorola’s fate must be ready to develop a mature valuable product with a low-risk profile: reliable, stable, safe and ecological, with high-quality service and user experience at a competitive price. Most start-up companies find it difficult to compete with the process of developing a mature product, and they prefer to be sold and swallowed up by one of the giant organizations that is seeking to freshen itself up with the spirit of young innovation (or to beat its disrupting competitors.) In most cases, the initiative is then choked by the traditional managerial culture that rejects high-risk entrepreneurship and the purchasing company loses its inherent potential for leadership and is unable to embed the culture of innovation and the ability to develop ground-breaking technology. The process of creating value in a ground-breaking yet sustainable initiative is thus composed of two different stages of action: The stage of entrepreneurship has a high-risk profile and involves ground-breaking innovation; while the maturation stage requires systematic action within a framework of strict standards. To maintain their achievements, high risk profile entrepreneurs must learn to change their working value streams procedures once they have penetrated the market and adapt the lead time and the product life cycle (PLC) to a level of maturity that meets the expectations of the customers at the heart of the market. As in a multi-stage space launch, high risk profile work is effective to the point at which the initiative is freed from the force of gravity and the market status quo. Having completed its role, the missile must disconnect from the space vehicle as it makes its way towards its far-off objective. Managing the necessary tension between the spirit of the ground-breaking founders and the orderly, low risk profile processes, whose purpose is to expand and stabilize, can only be accomplished in diverse action teams, some of which are suited to a high risk profile and others of which are geared towards the low risk profile processes. To manage the crossover from the technological risk to the business risk, a company must create a technological vision (with a high risk profile) along with mature products that compete at a low risk profile in response to the heart of the industry. The role of the managers is to create human and labor resources and design the work processes through which product development must flow. The internal entrepreneur known as the Value Creating Architect (VCA) is the one who leads the programs of development, manufacture and delivery of the product to the customer, as well as the transition from the space in which development is at a high risk profile to the space in which the product is stabilized at a low risk profile within the framework of work standards, up to the development of a new product with a high risk profile.